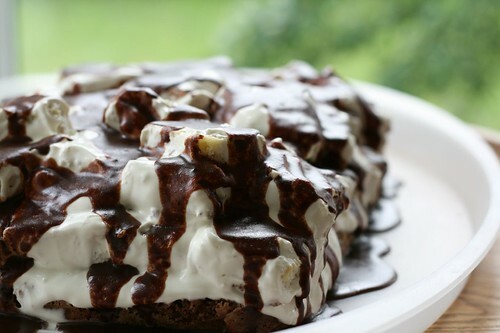 My name is Manu and I`m looking for a estonian cake recipe... the problem is I don`t know the cake`s name, but it is a chocolate cake,with peaces of sponge cake with french cream. Do you know any thing similar??? I just love this cake, I will be so thankful if you could help me. After a moment of confusion, it hit me - Kräsupea, which translates as (someone with) curly hair, though "microphone hair" wouldn't be all wrong either! It's an ever-popular cake on children's birthdays, and I've made it for my two nephews on countless occasions. I don't know the exact origins of the cake, but it's been popular in Estonia since late 1980s or so. Preheat the oven to 180 C / 350 F. Line a small baking sheet (a Swiss roll tin is excellent) with a parchment paper, and line a 24 cm springform tin also with parchment paper. Whisk the eggs, sugar, flour, soda and sour cream until combined. Quickly pour about 2/3 of the mixture onto a small baking sheet. Now add the cocoa powder to the rest of the mixture, and then pour that into the lined round cake tin. Place both of the baking tins into the oven and bake for about 25 minutes, until golden brown (test for doneness with a toothpick - it should come out clean). 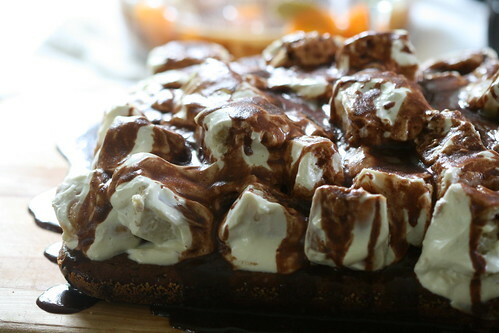 Place the dark cake on a cake tray, spread with a thick layer of sour cream. Cut the light cake into large cubes, then mix gently with the rest of the sour cream - you don't want to break up the cake cubes. 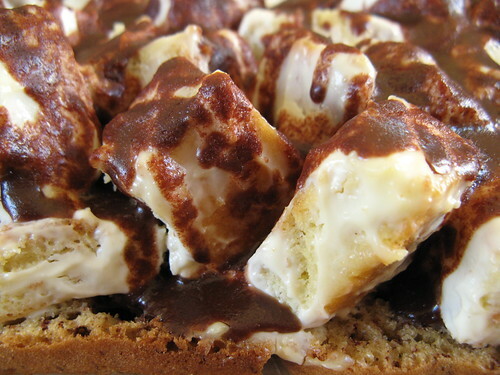 Pile that mixture of cake cubes and sour cream on top of the cocoa base - whether you want a dome or something flatter, is up to you. To make the glaze, gently melt the butter, pour in the cream, cocoa and sugar. Stir until smooth and then drizzle over the cake. (This is the traditional "chocolate glaze" of the 1980s and 1990s, when proper chocolate was hard to come by. Feel free to substitute with proper melted chocolate glaze). Leave to stand in the fridge or cool place for about 12 hours before serving.